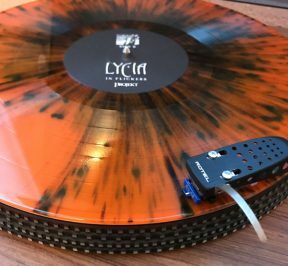 We sold through the first vinyl edition of LYCIA In Flickers so quickly that I didn’t want to leave anyone out! I placed the 2nd edition order immediately and it’s now here! Mike chose this striking orange with black splatters design, it’s in our shops and ready to ship to arrive by Xmas (fingers crossed). This will make a lovely present for the LYCIA fan of the family (or for yourself, of course)! Purchase from the Projekt webstore, the Projekt bandcamp page, and in Europe, purchase from our European Webstore which offers speedy shipping and low postage rates. The Projekt webstore has the last copies of the In Flickers T-shirt, just a few left in each size. All stores stock the CD edition. In Flickers has been selling incredibly well via our European distributor, Audioglobe. It’s great to see so much love for Lycia over there! If you’ve ever wanted insight into the business side of Projekt Records, then check out my interview on The Future of What Podcast. It’s a weekly podcast / radio program about the music industry for insiders, outsiders, and outliers; I talked with Portia (of Kill Rock Stars Records) for 45 minutes about my 35 years running Projekt. It’s an informative conversation with lots of behind-the-scenes on staying in business through all the changes I’ve experienced. Cassettes to LPs to CDs to digital, back to LPs, crowd-funding, connecting with fans. If you’re in a band, running a label, or just a fan who wonders how it’s possible I’m still here putting out this great music for you, give it a listen. After my interview, Steve Roach is on for great insights from his side of the music world. He’s been at it even longer than I have; he’s been through the same experiences, but from a different perspective. Steve also talks about his creativity, which I find really intriguing. I don’t usually listen to my interviews, honestly, but this one turned out so good that I streamed to the whole thing. A really interesting conversation. 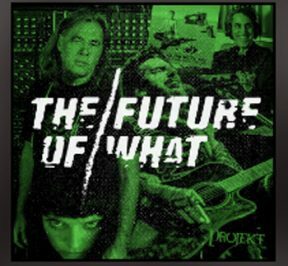 It’s the current episode of The Future of What.